It's been a little over two years since Google introduced the first Chromecast, a cheap and easy way to turn any TV in your house into a smart TV. The tiny little dongle has taken the market by storm, racking up sales of over 20 million since launch. Now, the company has replaced it with not one but two streaming devices: a direct successor to the original video-focused Chromecast and a new, audio-only device appropriately called the Chromecast Audio. Just as the original Chromecast made our dumb TVs smart, the Chromecast Audio promises to take your old pair of speakers and bless them with the convenience of streaming music. The value proposition is easy to understand: The Chromecast Audio is only $35, barely takes up any space and is easy to set up, and works with Spotify, the most popular streaming-music service on the planet. 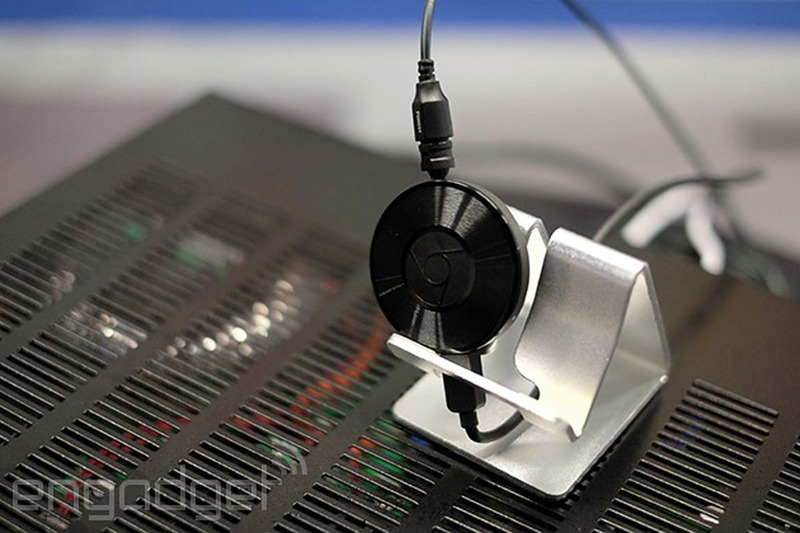 As Google tells it, it's a foolproof way to get streaming music onto your speakers. I've been testing the device since its introduction last week to find out if it delivers on that promise. If you have a good set of speakers and want to stream music to them, the Chromecast Audio is a simple and inexpensive way to make them work with almost all of the the top music services. The combinationof a great price point, wide compatibility and dead-simple setup makes it easyto recommend. 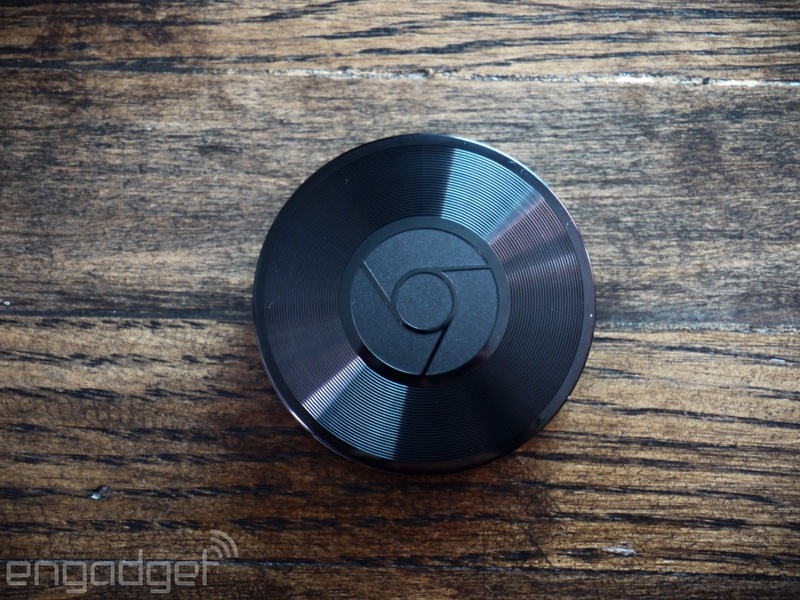 How would you rate the Chromecast Audio? Google's focus on simplicity starts with the hardware: Chromecast Audio is a tiny black plastic disc that isn't much larger than a big watch face. The box it comes in is pretty small itself, but even then, the box's size made me think the actual hardware would be larger than it really is. It's an unobtrusive and portable device, although it's not the most premium-feeling gadget I've ever used. Still, it feels sturdy and solid enough (particularly given its low price), and it shouldn't require kid gloves if you choose to take it out of the house. There are only two ports to speak of: micro-USB for power and a 3.5mm audio jack. That jack works with a straight 3.5mm-to-3.5mm audio cable, a 3.5mm-to-RCA cord or an optical audio output. The latter is a particularly welcome addition for such an inexpensive product. Physical setup couldn't be easier: Plug the 3.5mm jack into your speakers using your preferred cable (Google helpfully includes a short one in the box), and plug the included micro-USB cord into its small power adapter. 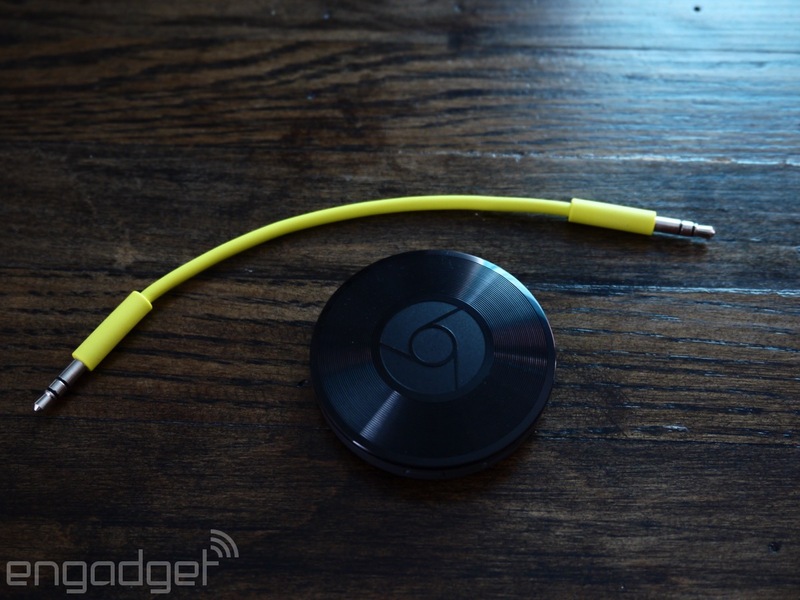 A tiny LED status indicator and a single hard reset button flank the Chromecast Audio's power input. I didn't need to use either in my time with the Chromecast Audio, but if your LED goes orange, you'll know that your device is having trouble connecting. Once you've placed the hardware where you want it, just download the Chromecast app to your iOS or Android device to get the Chromecast Audio hooked up to your WiFi network. If your Chromecast is powered on, but not set up, you'll see it in the app with a note that it needs to be configured. The process is simple: The app plays a test tone through your speakers; you give the Chromecast a name; and tell it which WiFi network to connect to. Once that's done, you'll be ready to use any Chromecast-compatible apps on your iOS and Android devices to stream music straight to your speakers. Once Chromecast Audio is set up, all you need to do is start playing something through a Chromecast-compatible app and tell the app to send the music to your speakers rather than on your phone or tablet. You'll typically see a small "cast" icon on the now playing screen -- hitting that will ask you where you want to cast to. Tap the Chromecast Audio that you've just set up and you're good to go. In my testing, this worked essentially every single time, across a variety of apps, including Google Play Music, Spotify, Pandora and Rdio. If those apps aren't to your liking, there are plenty more to choose from. For music fans, iHeartRadio, Deezer, TuneIn Radio, Rhapsody and Songza are also supported (among many other, lesser-known options). If you're more into spoken-word content, NPR One, Pocket Casts, Podcast Republic and numerous others work with the device, too. Overall, the Chromecast Audio streamed music near-instantly most of the time. Every so often, I'd have difficulty getting a stream started using Google Play Music -- I'd have to disconnect and reconnect from the speakers to get music going, but for the most part it worked just as advertised. Then again, I was having some general trouble with my WiFi network that same day, so it could have been a result of a bad connection to my router rather than an issue with the Chromecast itself. Indeed, a router reboot seemed to do a lot for Chromecasting consistency the next time I tried streaming some music to my speakers. Given how Google positioned Spotify as a killer app for the Chromecast ecosystem, you can rest assured that the service worked flawlessly with the Chromecast Audio. When you're playing music on your iOS or Android device, you'll see the option to cast music in the same area where you can use the standard Spotify Connect and AirPlay options. The only downside is that Spotify doesn't let you cast music from the desktop app for Mac and Windows. Fortunately, if you really need to cast from your computer, you can do so in the Chrome browser using Spotify's web player. It's worth taking a moment to note how using Chromecast differs from using Bluetooth or Apple's AirPlay technology. Once you send music to your Chromecast Audio, the device is reaching out to the internet directly and pulling the music down, rather than streaming to your phone and being bounced over to your speakers. That means that once you start casting music, you're free to do anything you want with your phone and not worry about interrupting the tunes. If you've used a Bluetooth speaker, you've probably noticed your phone's notifications being piped through as well -- that won't happen here. There are also some theoretical quality improvements that come from using WiFi instead of Bluetooth or AirPlay. While I believe those claims on a technical level, the truth is that I didn't notice any major differences using the Chromecast Audio versus connecting an Apple AirPort Express to the same speakers, with audio being AirPlayed through my phone or tablet. Speaking of audio quality, the Chromecast Audio exists in a somewhat strange place in that regard. To use it, you need a pair of dedicated audio speakers to hook it up to, something that many people these days don't find as important as they did in decades past. For anyone out there who's spent a decent amount of money on audio speakers, there's a chance that the hardware inside the Chromecast Audio won't be of high-enough quality for such a purchase to make sense. Google says it has a "world-class" digital-to-analog converter inside it, but how good can it really be for a $35 product? It's great to have a cheap way to make your dumb speakers smarter, but I'm not convinced the target market for such a device is terribly large. Consumers interested in high-quality audio probably already have a set of decent speakers and a system for getting digital music to them (like the significantly more expensive Sonos Connect), while many others these days are happy enough to use a set of Bluetooth speakers. Still, there's a huge price gap between something like that Sonos option and the Chromecast Audio, and there are probably enough people out there who've acquired some good speakers over the years to make a $35 investment an easy decision. Take me, for example: I have a fairly nice pair of Audioengine A2+ speakers that are hooked up to a turntable, but I've never found a great solution for streaming music to them. My AirPort Express worked fine, but as a day-to-day router, it didn't quite make the grade, so I swapped it out. Streaming music to these speakers isn't something I'm going to do every day, but having the ability to do it is certainly worth $35 to me -- particularly when entertaining guests, flipping a record every 20 minutes gets a bit tedious. The easiest way to add streaming capabilities to older speakers is probably to use a Bluetooth adapter like the $40 Logitech Bluetooth Audio Adapter or the higher-end and more expensive $189 Audioengine B1 Bluetooth Music Receiver. But then you're dealing with some of the flaws inherent in Bluetooth audio -- a downside if you have high-quality speakers. The Sonos Connect is an obvious comparison to the Chromecast Audio, but there's one huge difference right up front: It costs 10 times as much as the Chromecast. However, that price gives you the ability to tie older speakers into the wider Sonos ecosystem, which means they can be part of a multi-room playback system that includes other Sonos speakers. Of course, if we're talking about multi-room playback, we're talking about multiple sets of expensive speakers; the cheapest Sonos standalone speaker starts at $199. Again, the Chromecast Audio exists in a somewhat unusual space: It's a bargain device, but you have to be at least somewhat serious about home audio to be interested in it. There are plenty of other options beyond Sonos for adding wireless to your speakers, though most of them will cost more than the Chromecast Audio. Audioengine and Polk make wireless kits to add streaming music to your speakers, but again both are significantly more expensive than what Google is selling. Samsung offers a $50 wireless option -- but it only works with the Samsung Shape speakers, so it's not a real option for most people. If you're an Apple Music subscriber, adding an AirPort Express to your existing speakers would make a lot more sense than a Chromecast Audio. AirPlay is a pretty great technology and you'll be able to stream not just Apple Music but also most other audio apps for iOS to your speakers using the AirPort Express. Of course, it's more expensive at $99, but if you're an Apple loyalist, you're probably used to paying a little bit more. 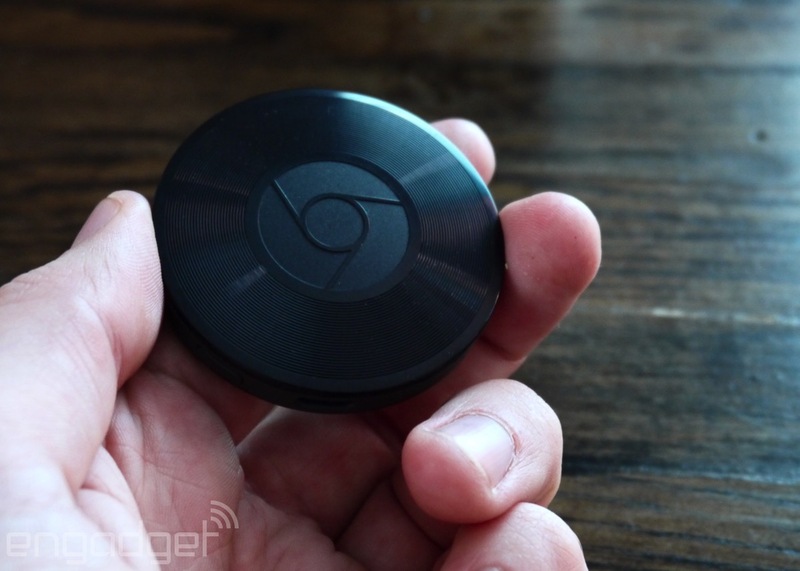 It also does quite a bit more than the Chromecast Audio, as it's also a full-fledged WiFi router. The last and most obvious competitor is the main Chromecast itself: For the same price, the Chromecast 2 lets you use all of these audio apps and at the same time delivers a host of video content to your TV. If your television has a decent set of speakers (either built-in or external), you'll probably get more mileage out of a standard Chromecast. Most TV sets these days will probably work well enough for background music at a party or some casual listening, and if you have a good home theater audio setup, you'll do even better. 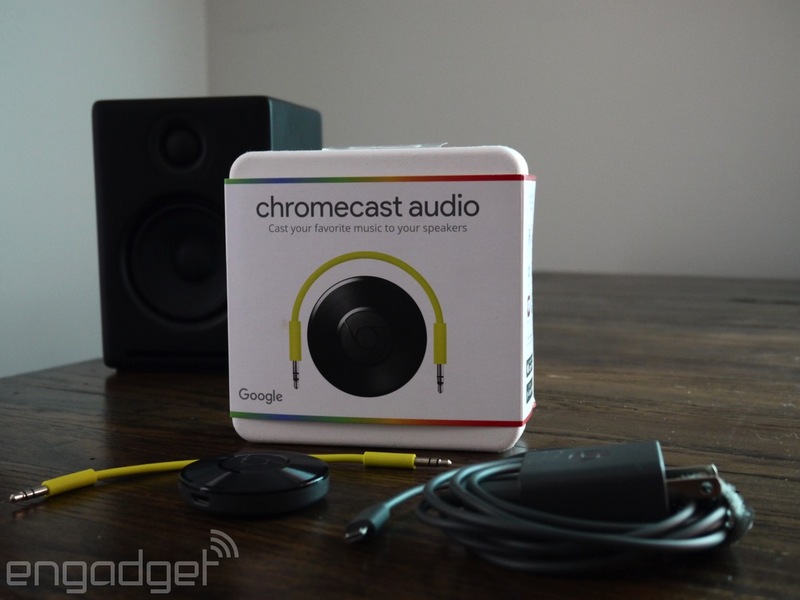 Even if the market for Chromecast Audio is somewhat limited, it could be incredibly useful for the right person. Good speakers tend to last a long time, but the way we listen to music has evolved significantly in the last five years. If you still have a set of speakers you love, but wish they had the brains to get online and stream music from nearly all the best services (Apple Music fans, you'll obviously have to look elsewhere), the Chromecast Audio is an easy recommendation. It's cheap, easy to set up and does exactly what it's supposed to. That makes it a great product, even if there isn't necessarily a ton of demand for it.